Exclusive Pumaspeed 400+ bhp Edition Larger Bore Pipework by Milltek Sport Pumaspeed and Milltek Sport bring you the Full Blown ULITIMATE Cat Back Exhaust. Available in non resonated and fully resonated. 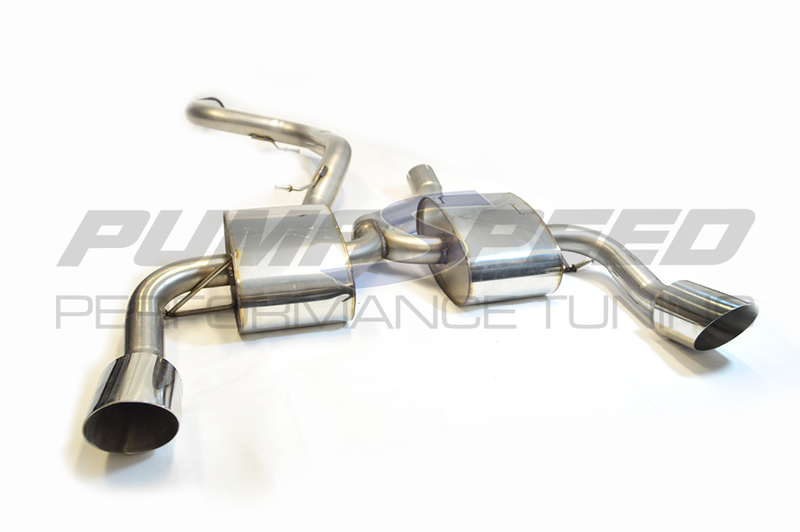 Not Content with the near perfect Non-Resonated Catback Exhaust on the new 2009 Focus RS Mk2, the precision designers at Milltek Sport were asked by Pumaspeed to create the ULTIMATE CAT BACK EXHAUST to cope with the latest large power outputs over 400 bhp. With larger bore pipework and higher specification internals within the silencers, this new system will flow more gas whilst creating only slightly more noise. Noise levels have been tested and found the just right sweet spot that will deliver the roar on command but remain subtle enough at autobahn speed cruising. Will this new rear silencer fit my Focus RS Mk2? This system is full interchangable with all milltek manufactured systems. Please check the part number on the rear silencer if it says '166' on it then yes it will. The Pumaspeed Workshop team are ready to fit the Focus RS Mk2 ULTIMATE EDITION Milltek Sport Cat Back Exhaust in our Head Office located here. Therefore making parts and labour a total cost £837.98 (inc. VAT). Pumaspeed have a specialist distribution team that can dispatch the Focus RS Mk2 ULTIMATE EDITION Milltek Sport Cat Back Exhaust to any destination worldwide.